Student Motivation in International Collaboration: To Participate or Not to Participate? 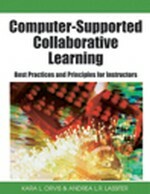 This chapter introduces peer reviewing as a form of collaborative online learning, which can be used in higher education. Peer reviewing encourages students to engage in reflective critical evaluation of each other’s work through participation in online discussion with their peers, who may be located anywhere in the world. The advantages of such an activity for students are described, using the experiences from two cases. The chapter highlights the impact that student and tutor motivation has on the successful participation of students in online peer reviewing activities, as well as perceived benefits for students, including acquiring various skills, and development of intercultural awareness. There is a discussion of potential difficulties, such as timing and different expectations, along with challenges for tutors in designing an online peer reviewing activity, culminating in a template that can be used as an aid for tutors to use when planning an online peer reviewing activity.